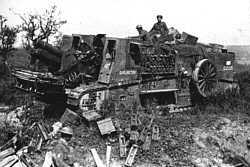 Toppled German A7V, Elfriede, at Villers-Bretonneux, 24-Apr-1918. This British Mark IV is under new management - German. British Whippet tank. Fast as far as its competition at 8 mph, it was powered by twin 45 h.p. Tylor engines. Its crew of three was armed with three Hotchkiss machine guns. The one in the photo has extra fuel hanging outside the track support. Canopied British Mark Vs on their way to the front. 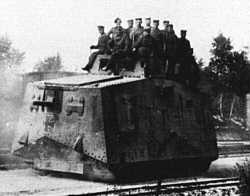 The majority of the A7V crew rides atop their vehicle at the railhead near Villers-Bretonneux , April 1918. This 32 ton monster required twin Daimler engines (105 h.p. each) and a crew of 16 for operation. 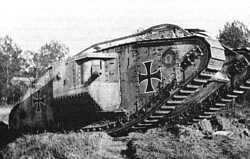 It was armed with one 57mm cannon and six Maxim machine guns. A group of Renaults with their crews at Hamel, July 1918. 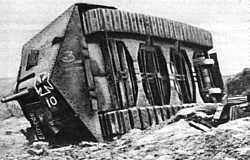 This two man tank had speed and mobility but could not cross trenches. The rotating turret could support either a 37mm cannon or a heavy machine gun. British Gun-Carrier armour vehicle. Its Daimler engine and four man driving crew made it similar to a Mark IV. Early on they were used to transport 6 in. howitzers or 60 pound guns. 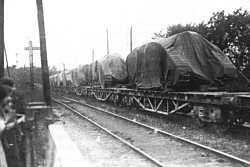 Later on they proved more useful in transporting supplies. Note the spare ammo stored on the side of the tank.